We have the biggest, coolest and wettest rides around! You hear the screams from the distance as riders take sharp turns through a dark tunnel before the rumble of a full 45° drop that accelerates the multi-person raft into the immense funnel. This ride literally screams excitement when a 2-person raft takes you through twists and turns in total darkness before dropping you into a dark vortex funnel for the ride of your life. Get ready for a spine-tingling, heart-pounding, brain-draining vertical plunge. 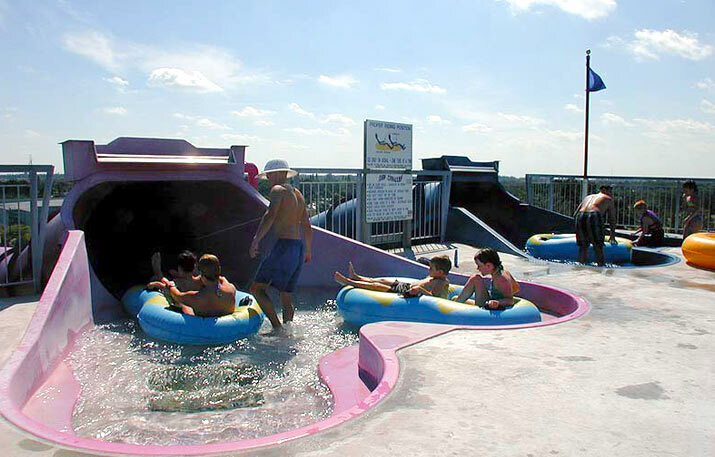 The Brain Drain features two 70-ft. high enclosed flume waterslides. Each slide is uniquely designed with different slide patterns but are simultaneously launched at the same time. The FlowRider double brings the surf inland for some non-stop body board action. The constant, single location waves give riders a chance to show off their boarding moves. Not for the faint hearted. Feel the world drop out from under you as you blast through the narrow looping and twisting enclosed tunnels on one of the most exhilarating rides. The race is on for fun! This high speed slide features six lanes for racers to ride downhill head-first for a race to the finish line. Riders start off in an enclosed flume that loops before the ride opens and riders continue to race each other to see who had the fastest time on the scoreboard. Fun for all ages. A tubeless, single rider, high-energy ride that starts out in an enclosed dark chute before entering the bowl at full speed. After multiple high speed spins around the perimeter, a gradual deceleration moves the rider towards the exit at the bowl’s center and into a splash drop landing. A single or double rider, high-energy tube ride that starts out in an enclosed dark chute before entering the bowl at full speed. After multiple high speed spins around the outer perimeter, a gradual deceleration moves riders towards the exit at the bowl’s center. No mats, no tubes – just you! Soar through heart-pounding drops and pulse-racing dips and curves as you blast through 1,000 feet on an enclosed flume. The 4 flumes that started it all! These 4 spiraling slides are still an all time park favorite sending riders plunging down 1600 feet of twists and turns. Ride each one of them for a different experience. This multi-person raft ride takes you for a loop in an enclosed flume before opening up to a series of breathtaking drops and dips with a super splashdown. All ages can share the excitement. 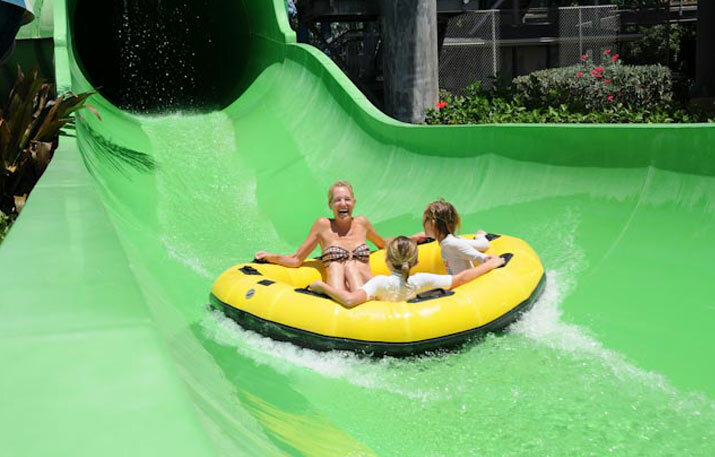 The number one family raft ride in the world sends up to 4 people rocketing through a mammoth 10-ft wide flume of 500 feet of twists, turns and banks of raging white water and three water walls before an incredible splash down. Dare to ride out the storm in this totally tubular ride. Grab a tube and travel in the dark at the speed of light with 360 degree loops and thrilling back-to-back turns as you zoom downward through 1,000 feet of tunnel before a cool splash landing. NEWEST ATTRACTION — This new water play structure is packed with interactive features like sprayers, 3 slides and a giant Pineapple tipping bucket to make a super splash below. Catch a wave in our 25,000 square foot wave pool with 6 different wave patterns that can go up to 6 feet high. Challenge yourself to cross over floating icebergs, fruit and more without falling into the water. Fun for all ages. Grab a tube and float around the quarter mile lazy river. Journey past water shooting cannons, aquatic mists, a wave channel, fountain islands and through a cascading waterfall. Children and non-swimmers should be attended by an adult. So many slides and so many colors! There are a total of 8 to choose from with both open and enclosed slides. Great for all ages. Young adventurers have an even bigger place to make a splash with three slides, a fort, water shooting cannons, floating swamp animals, a shipwreck and more.